In recent years we have developed some odd Christmas traditions as a society – in particular, those associated with supermarkets. While the ever bloated, haunting-cover-of-a-pop-song-accompanied adverts are interesting, my real interest is the meal deal festive sandwiches offered by these supermarkets. I have tasted and ranked no less than 15 different varieties from 6 shops and used this new experience to help me formulate my own take on the Christmas sandwich. I found the best Christmas sandwiches were those that tasted more of the feeling of Christmas. Some attempted a more direct recreation of the Christmas dinner – the inclusion of Brussels Sprout coleslaw or even gravy based sauces – but I’ve opted more for a collection of general Christmassy flavours. The sage and turkey from the meal, sausages from the breakfast and pigs in blankets, smoked cheese because what is Christmas without cheese and smoked flavouring evokes the idea of smoked meats. 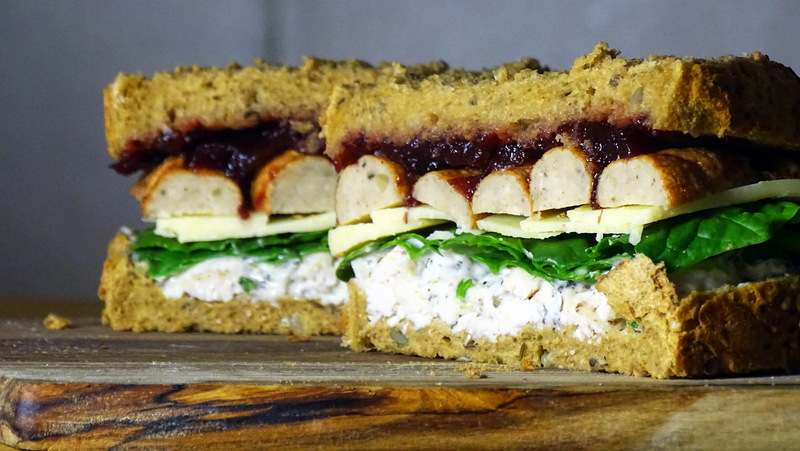 Cranberry sauce is a must, and the spinach provides an element of veg without you know…including parsnip in a sandwich. Whether you make it beforehand to get into the Christmas spirit or use it as the basis of a boxing day sandwich, this really is a must. Gently fry around a teaspoon of dried sage in a tiny bit of butter – less than half a teaspoon, just to activate the flavour, really. Mix into a couple of spoonfuls mayonnaise and coat the turkey. Season to taste, then spread a layer onto one slice of bread. Cover with a few spinach leaves, then a layer of the sliced smoked cheese, then the sliced sausages. Finally, spread the cranberry sauce onto the top layer of bread, and use it to finish off the sandwich. Slice gently, so as to not ruin that beautiful cross section. Posted in Guesscipes, Poultry, Sides and SnacksTagged bread, cheese, christmas, december, festive, guesscipe, Header, holidays, recipe, sandwich, turkey, winterBookmark the permalink. Not a big fan of covering food in mayonnaise which is very much an American fad… so will substitute with bread sauce. Spinach hmmmm will give it ago… but not Christmas food. Overall I like it defo going to give it ago this Christmas.